THIS LISTING IS FOR 1. 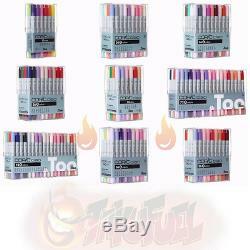 Copic CIAO Marker 12pc, 24pc, 36pc, or 72pc Set [SELECT SET]. Please select your set choice from the drop down above and then select add to cart. Are an AUTHORIZED COPIC DEALER. We'll make it right! We know our product and want to see you get the most from your investment. Just because the sale is complete, does not mean our relationship has to be. Join the family and share your artwork with us on. Copic Ciao Markers: 12 Color Set [Basic Set]. 12 Basic colors: YG06, G17, BG09, B29, E29, 100, BV08, V09, RV04, R29, YR07, Y06. Copic Ciao Markers: 24 Color Set [Basic Set]. 24 Basic colors: E00, E21, E29, E37, C3, 100-Black, G05, BG09, BG23, B00, B24, B29, YR07, Y00, Y08, YG03, YG06, G00, BV00, BV02, RV02, R20, R29, YR02. Copic Ciao Markers: 36 Color - Set A. 36 Basic Colors: B00, B24, B29, E00, E21, E29, E37, C3, 100, YG03, YG06, YG11, G00, G05, G17, BG01, BG09, BG23, R20, R29, R32, YR02, YR07, YR20, Y00, Y06, Y17, BV00, BV02, BV08, V04, V09, V12, RV02, RV04, RV10. Copic Ciao Markers: 36 Color - Set B. This set extends set to secondary colors and includes Cool Grays: E08, E33, E35, E47, E51, C1, C5, C7, 0, BG10, BG15, BG93, B05, B23, B32, B39, E02, E04, YR00, YR04, Y02, Y08, YG41, YG67, G02, G21, G99, BV04, V17, RV21, RV23, RV29, RV42, R02, R27, R59. Copic Ciao Markers: 36 Color - Set C. This set includes intermediate colors (pastels): B02, B12, B60, B63, BG05, BG34, BV13, BV23, BV31, E11, E31, E50, E53, E71, G000, G07, G14, R00, R05, R11, R22, RV000, RV06, RV13, V000, V06, Y11, Y15, Y21, YG00, YG23, YG63, YR16, YR23, YR31, YR61. Copic Ciao Markers: 36 Color - Set D. This set extends intermediate colors and adds Warm Grays: B45, B93, B95, B97, BG49, BG96, BV17, BV29, E43, E49, E57, E77, E93, E95, G28, G85, G94, R17, R35, R37, R46, R85, RV34, RV95, V15, V91, V95, Y28, Y38, YG91, YG95, YR68, W1, W3, W5, W7. Copic Ciao Markers: 36 Color - Set E.
These colors were previously available in the Sketch line, but are now extended to the Ciao as well: C0, C2, W0, W2, B000, B18, B28, B99, BG000, BG13, BG72, BV000, BV25, E000, E15, E18, E25, E40, E41, E59, E79, G29, G82, R000, R14, R81, RV14, RV69, V01, V05, Y000, Y35, YG09, YG17, YR000, YR15. Copic Ciao Markers: 72 Color - Set A. This set contains the following colors: B39, E00, E02, E04, E08, E21, E29, E33, E35, E37, E47, E51, C1, C3, C5, C7, 0, 100, G00, G02, G05, G17, G21, G99, BG01, BG09, BG10, BG15, BG23, BG93, B00, B05, B23, B24, B29, B32, R29, R32, R59, YR00, YR02, YR04, YR07, YR20, Y00, Y02, Y06, Y08, Y17, YG03, YG06, YG11, YG41, YG67, BV00, BV02, BV04, BV08, V04, V09, V12, V17, RV02, RV04, RV10, RV21, RV23, RV29, RV42, R02, R20, R27. Copic Ciao Markers: 72 Color - Set B. This set contains the following colors: BV13, BV17, BV23, BV29, BV31, V000, V06, V15, V91, V95, RV000, RV06, RV13, RV34, RV95, R00, R05, R11, R17, R22, R35, R37, R46, R85, YR16, YR23, YR31, YR61, YR68, Y11, Y15, Y21, Y28, Y38, YG00, YG23, YG63, YG91, YG95, G000, G07, G14, G28, G85, G94, BG05, BG34, BG49, BG96, B02, B12, B45, B60, B63, B93, B95, B97, E11, E31, E43, E49, E50, E53, E57, E71, E77, E93, E95, W1, W3, W5, W7. I36E 36pc Ciao Set E. The item "Copic CIAO Marker 12pc, 24pc, 36pc, 72pc SELECT SET AUTHORIZED COPIC DEALER" is in sale since Tuesday, May 23, 2017. This item is in the category "Crafts\Art Supplies\Drawing & Lettering Supplies\Art Pens & Markers". The seller is "otakufuel" and is located in Panama City Beach, Florida. This item can be shipped to United States.